Prenzel is an International award winning brand, which has succeeded in combining European tradition with New Zealand's vibrant flavours, to create unique and exquisite food and beverage products. The wide range of Prenzel products encompasses fruit brandies, limited edition liqueurs, schnapps, infused rice bran oils and sea salts, gourmet vinegars and much more. Prenzel also has a food service department producing Australasia's largest range of natural culinary concentrates and gels for the hospitality and food manufacturing sectors. In 1989, Robert Wuest visited Hugh and Chris Steadman at their cherry orchard on the outskirts of Blenheim in Marlborough. Robert came from an old distilling family in Alsace in Eastern France, a region famed for its eaux-de-vie (“fruit brandies.”) Amongst the cherry blossoms an idea came to him. In Alsace, small mobile stills had been a traditional part of village life for many generations. After World War II, in an attempt to simplify the collection of duties on alcohol, the French government outlawed these artisanal stills. Those that escaped destruction went into hiding. Alouette, as she was to become known, was one such political fugitive. Discovered cowering in a widow's cellar in Mulhouse, she was smuggled across the Swiss border and then shipped to NZ. The i initial distilling trials were carried out in a shed at the back of the cherry orchard with Leon Sorg, an Alsatian distiller, training a Kiwi apprentice who later followed him back to Alsace for further training. The results were promising. Marlborough's high sunshine hours along with the unpolluted skies and vigorous soils, offered the potential to produce fruit brandies of exceptional quality. This finding was confirmed four years later with a gold medal won by Prenzel’s Pear William brandy at Destillata, the world’s largest open fruit brandy competition, which is held annually in Austria. 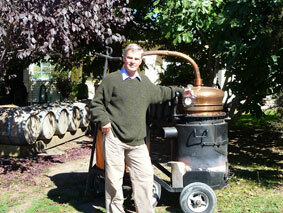 The Alsace New Zealand Distilling Company Ltd. was subsequently registered in Blenheim in 1992 as New Zealand's first commercial fruit brandy distillery. At this stage of the company's development , it was dedicated to the production of a wide range of fruit brandies, tipsy cherries and Waterloo Gin. Re-branded as the Prenzel Distilling Co. Ltd. in 1994, the company grew large enough to look seriously at its distribution network. The beverage range was initially sold through wholesalers and retail liquor outlets, but the “experience” of Prenzel products could not be passed on to the customer using these traditional sales avenues. Blind tastings with other market leaders and the Prenzel equivalent in the distillery’s own tasting room showed that Prenzel products were always preferred: but how could they be brought to people’s attention? The answer was Prenzel Direct. Born in 1997 it quickly became a vital marketing and sales arm of its parent company. As an alcoholic version of the time-honoured party plan concept, Prenzel guests around the country were soon enjoying an in-home opportunity to taste before purchasing. At the same time, to help provide a social balance between beverage and food at the parties, Prenzel introduced items such as infused olive oils that were designed for the kitchen, rather than for the drinks cupboard. Prenzel is now as well known for its food items as it is for its beverages. Traditionally in Europe, fruit distilleries have two distinct product lines. 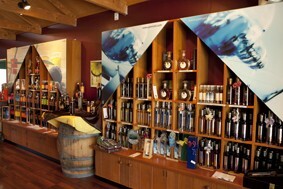 Firstly, they have the fruit brandies and liqueurs for which they are best known, and which flagship their brand. Secondly, they produce a range of highly alcoholic concentrates and gels for chefs, bakers, chocolatiers and food manufacturers, to use in their formulations. Now under the ownership of Kiwi Flavour Infusions Limited, the Prenzel brand continues to flourish, with its food service department manufacturing and selling a wide range of culinary concentrates throughout New Zealand and internationally. If you are a food service customer and are interested in Prenzel products, please view the food service pages, email foodservice@prenzel.co.nz, or call us on (03) 520 8215.